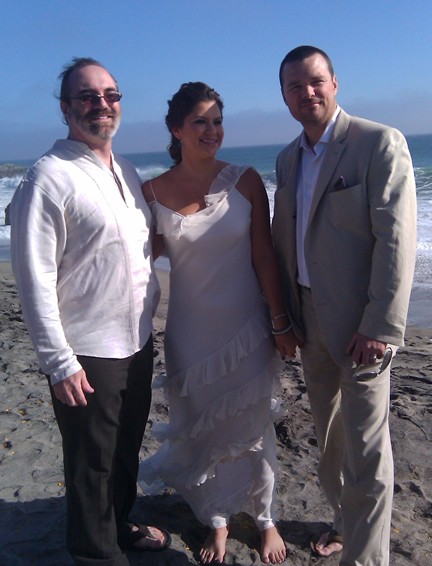 This afternoon, I had the extreme honor of being the officiant for Mark and Rachel at their Malibu beach wedding. This was a bona fide, full on, sand and waves beach affair, taking place at the southern end of the campground beach area of the Leo Carillo State Park in Malibu. I really liked this section of beach at Leo Cabrillo. Even with the PCH traffic not too far away, we really could not hear any car noise at all. 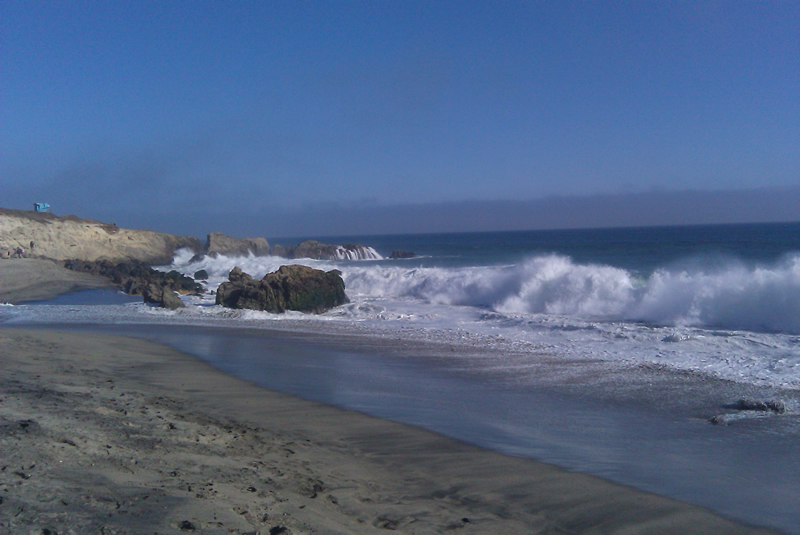 What I did have to project over were the waves crashing upon the rocks and beach just behind and beside me. Since “Malibu” comes from the Chumash Indian word “humaliwo” meaning “noisy surf,” that was to be expected, and I think the surf was beautiful, powerful background music to the intimate ceremony I led. I really like officiating at casual weddings, and Matt and Rachel’s wedding fit the bill. Pretty much everyone was wearing sandals or flip flops, and the gathered family and friends simply stood in a tight semi-circle around the couple and me, creating a sort of wedding-in-the-round effect. I loved it. I also loved that the sun burned off the marine layer just as we began the ceremony! 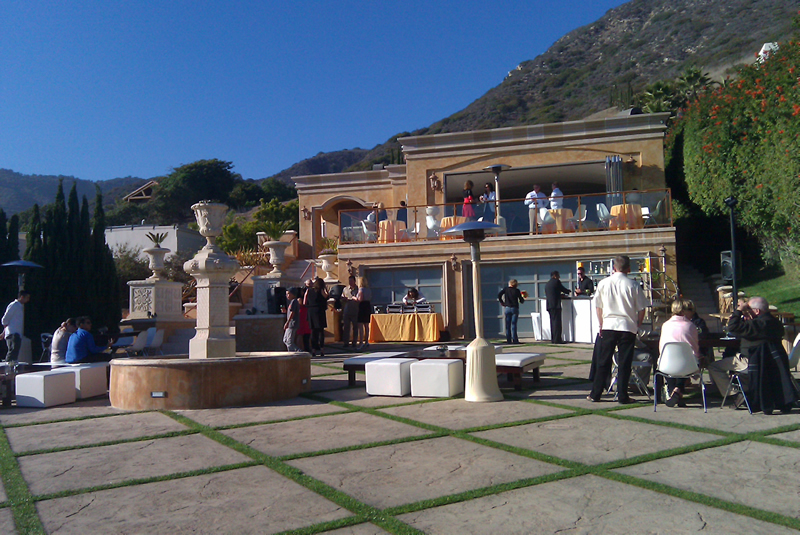 After the declaration, kiss and final blessing, the wedding party retired to a beautiful home overlooking the ocean, a few miles south of Leo Carillo Park. I would have loved to have spent a few hours chilling out at the reception, but after a few appetizers served by black-clad server lads, a glass of chardonnay and signing the wedding license, it was time for me to give my final good wishes to the couple and their parents and hit the road back to Burbank. Congratulations, Matt and Rachel! Thank you so much for including me in your wedding as your officiant. Wedding officiant specializing in "personal touch" weddings. I make sure that every ceremony I create and lead is a reflection of the values, beliefs, humor and wishes of each couple. All couples are welcome, from the traditional to the off-beat, straight or gay. Free consultation for all couples before you make your officiant selection. This entry was posted in Uncategorized, wedding, wedding officiant and tagged Leo Carillo, Los Angeles, Malibu, wedding officiant. Bookmark the permalink.